Wills estates & trusts is an area of financial planning that has far-reaching effects on friends and loved ones. Some people assume that preparing a will or setting up a trust is a straightforward task—and this can be the case. Online services like Nolo.com offer low-cost, user-friendly options in the form of downloadable software or direct online form preparation. For some people, especially those with relatively simple estates, preparing things independently is a good option. However, there are certain aspects of estate planning that people don’t ordinarily consider, and when the time comes to put planning into action, important details are often left unresolved. Educating yourself is a good first step toward effective estate planning for the future of your loved ones. Pages like this one from AARP can give you a more in-depth understanding of what is involved in estate planning, but for the time being, here are four things that many people fail to consider when setting up wills estates & trusts. Many folks are good about remembering the tax man every April, but he is often forgotten when individuals prepare their own wills estates & trusts. The assumption is sometimes made that an estate is not valuable enough to be affected by tax law. But there are assets—such as retirement plans, trusts, and life insurance policies—that can be subject to unexpected taxation. The laws vary by State, and change constantly. Wills estates & trusts aren’t just for distributing possessions. Should anything happen that leaves you unable to make important decisions, a living will (also known as a an advanced healthcare directive) can be used to legally enforce your wishes. For example, being placed on advanced life support systems is something you may wish to accept or refuse under certain circumstances—but without prior planning, your preferences cannot not be enforced. 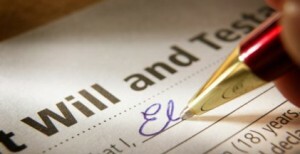 A living will ensures that your end-of-life wishes are carried out. It would be nice if your estate plans, once prepared, were permanently in place and up-to-date. There are two reasons why this is not the case: 1) Major life events (such as divorce, marriage or retirement) can change the size, nature and availability of estates, and 2) Applicable laws can change through time, effectively changing the nature of your estate plans. It is always advisable to periodically review your will, and learn about any changes to State law that may affect your estate. Major life events, such as marriage or divorce, should always be accompanied by a review of your estate plans. When wills estates & trusts are improperly prepared, legal intervention is often necessary. People sometimes seek to plan their own estates without professional help, using online services or forms directly available from judicial web sites, in order to save money in the short term. However, errors made during preparation often lead to hefty legal fees after the fact—especially when disputes arise.For many people, investing a small amount of money on the front end assures that all bases are covered and that the estate planning is executed smoothly. In addition, the fees for professional help are often nominal, since many lawyers have extensive experience in estate planning. Taking these things into consideration will held prepare the way for solid estate planning. If you’re looking for legal advice on wills estates & trusts in NJ, go here.